NB: This is a post I drafted and never posted, thinking I'd add more. I haven't time at the mo, what with moving to the other side of the planet and the issue is rapidly being overtaken by even greater crimes of mosgovernment so I thought I'd knock it out anyway. The sort of people who comment on CiF are a fairly unrepresentative slice of the British electorate. I'm thinking politically active, reasonably well educated people from a diverse array of political positions. This inclues everyone from the conservative, right wing authoritarian apes who split their time between there and the Daily Mail website as well as your more stereotypical Guardianistas, who are a happy to pass comment on pretty much any political issue over some organic breadsticks dipped in humous and some of that lovely yoghurt, mint and pea dip that sainsbury's do. Now, I don't know if the subject material of these two CiF articles are particularly rich moron bait, being on a a ridiculously fluffy subject such as sustainable development, or if over the last two weeks the nation's water supply was massively contaminated with the infective agent of Fucktard's Disease and I have mysteriously dodged the infection, but I have a problem with the general tone of responses. These consist mostly of the "dancing on the grave of the quangos" ideological reaction where the poster has scanned the title and subtext and then reacted viscerally to this with a torrent of ideologically-fuelled vitriol along the lines of "quangos are bad, mmmmmmmkay". "Total reduction in carbon emissions from administrative road travel was 30,601 tonnes. Average emissions per litre assumed as 0.0023035 tonnes / litre therefore savings of litres purchased is approximately 13.28 million litres. At an average petrol price of 103.2 pence/litre (April 2008 – March 2009) this equates to approximately £13.7 million pounds saved." Where does this original 30,601 tonnes carbon figure come from? I can't see it in the SDC self justification for their existence. And why is it applied in this weird backward manner to end up with a £13.7m monetary value? Is there no forward way to come up with a sum? Rather makes me think think they haven't saved a real sum of money that you could use, say, to build a hospital. They're just another bunch of suits blinding the gullible with the empty "sustainable" mantra. 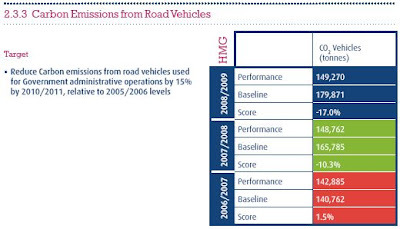 Note the 2008/2009 figures showing a 17% reduction in CO2 emissions, equating to 13,601.